Lewisville Personal Injury Attorney - Steele Law, P.C. Personal injury claims arise when a person is injured by the negligent, reckless, or intentionally wrongful act of another person. Negligence has a specific meaning in the context of personal injury lawsuits, but it is similar to the concept of carelessness. The person who acted wrongfully and caused the injury is required by law to compensate the injured person. In almost all cases these days, that compensation actually comes from insurance. Your personal injury attorney's job is to negotiate with the appropriate insurance companies for full and fair compensation for your losses. Personal injury claims can arise from car accidents, motorcycle crashes, truck accidents, dangerous conditions on property, or dangerous products. The resulting injuries can be serious and debilitating. Brain injury: A traumatic brain injury (TBI), often the result of a serious auto accident, is one of the most complicated and difficult to treat. An injury of this nature can affect cognitive function, motor function, sensation, and emotion, effectively transforming the injured person’s life. Treatment for brain damage usually involves an intricate mix of medication, surgery, therapy, and a multitude of specialists. Both the emotional and financial costs of this kind of injury are difficult to articulate. According to the CDC, the estimated cost of traumatic brain injuries in 2010 in the U.S. was an unimaginable $76.5 billion. Paralysis/spinal cord injury: A spinal cord injury - damage to any part of the spinal cord or nerves at the end of the spinal canal - often causes paralysis. Depending on where along the spinal cord the injury occurred, this paralysis may affect only one arm or leg, an arm and a leg on the same side of the body, both legs, or both arms and both legs. Similar to a brain injury, a spinal cord injury requires long-term rehabilitation to regain function and/or to adjust to a new lifestyle. While there is almost always hope of recovering at least some function, the process of regaining this function can go on for months or even years. Again, this long-term care will require continuous payments. Amputation: Traumatic amputation occurs when a limb is lost suddenly in an accident. Because an amputation is permanent, it can also require long-term care. Due to the sudden nature of a traumatic amputation and its catastrophic effects, victims report serious psychological symptoms as well. Grief over a missing limb can evolve into post-traumatic stress disorder or phantom limb sensations. The initial trauma care, plus the combination of physical rehabilitation and psychological treatment, can cause medical bills to pile up. 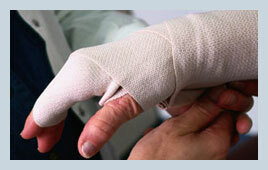 Broken bones: Compared to the injuries above, a broken bone is much more common and very treatable. In fact, according to the American Academy of Orthopaedic Surgeons, there are over 6 million broken bone cases in the United States each year. However, a severe broken bone can still require surgery, take weeks to heal, and cause further loss if it hinders job performance while healing. If the broken bone is set in a cast, the cast may immobilize the injured area for up to eight weeks. If a victim has a job that requires him to do heavy lifting on a regular basis, he may have a case to fight for lost wages. Burn injuries: The effects and treatment of burn injuries vary greatly depending on the severity of the burn. Burns are classified as first, second, or third degree. First-degree burns can usually be treated at home, while second- and third-degree burns require professional treatment. Unfortunately, treating a severe burn with skin grafting, a type of surgery involving removal of dead tissue and transplantation of healthy tissue, is one of the most painful processes a person can endure. Burns of this nature can take a months-long hospital stay to heal. The last thing a patient should have to worry about during this time is searching for funds to pay for his or her life-saving treatment. In the worst cases, an accident can result in death. In fatal accident cases, the surviving immediate family members have the right to seek compensation from the person responsible for the accident. A successful personal injury claim for compensation must give proof that the other person's actions caused your injuries. To prove liability, your personal injury lawyer will gather and present evidence, as well as review various state or federal laws that may impose responsibility for certain actions. Did You Know? Liability still must be proved even if you have a police report stating that the other person is at fault for a car accident. The laws governing your rights of recovery for personal injury vary depending on the specific facts of your case. For example, the laws that apply to an injury caused by a defect on the premises of an apartment complex are very different from the laws that apply in an accident involving a pedestrian and a car. The laws are also different depending on who injured you. A doctor, a government agency, and a private individual each fall under different laws that govern their legal responsibility for an injury caused by their actions or their failure to act. For a consultation about your specific situation, contact a Carrollton personal injury attorney at Steele Law, P.C., right away to discuss your rights and how we can fight to protect you. Lewisville Personal Injury Attorney Disclaimer: The information presented on this site should not be construed to be formal legal advice nor the formation of a lawyer or attorney client relationship. Any results portrayed here were dependent on the facts of a particular legal matter and results vary from case to case. Please contact an attorney at Steele Law, P.C. for a consultation on your particular case.